This week I'm talking about capsule wardrobe creation. I'm sharing my wardrobe from this summer and the tips and tricks I learned along the way! If you missed yesterday's introduction to the series, you can find it here! The other night I was talking to a friend about creating a color palette for my fall wardrobe and she looked at me curiously. "I'm not sure I know anyone who does that." Once upon a time, I didn't either. I've always been a nerd about color, but for most of my life I didn't deem it necessary to plan out a wardrobe palette. Just the phrase "palette" sounded pretentious to me. They're clothes, not works of art. You just sort of throw on what looks good together and go, right? This is a valid approach. My brothers and boyfriend alike would probably argue this is as far as the brain need stretch when considering what to wear each morning. For an eternal perfectionist like me, though, it never ends up as "easy-breezy" as all that. Sooner or later I'm stuck in a rut, feeling like nothing I own matches, and fighting the urge to shop my way out of this pickle and into another. Determining a color palette, whether it's just for a season or for every wardrobe update, can work wonders for time-saving and budgeting. For instance, have you ever purchased a t-shirt just because you liked the color, and then come home to realize you're going to have to Donald Duck it because you have absolutely no bottoms to match? You could've saved yourself the $12.99 (or $39.99, pending on your t-shirt taste) if you knew what colors were in your wardrobe to begin with. Having a set palette will also prevent you from running out to purchase that additional skirt to match the t-shirt, only to realize the skirt doesn't work with anything else in your wardrobe either. Oy! So how do you get started? A common approach is determining your seasonal coloring. While I stand behind this theory as an excellent starting ground, I don't necessarily think it's the be-all-end-all of wearable color. So I would instead propose starting with whatch'ya got: your current wardrobe. Turn out all of your clothes onto your bed or floor. (What's that you say? That's where your clothes are already? Bravo, then -- you're one step ahead.) Next, examine your clothing focusing specifically on color. You might sort your items into piles of blues, greens, reds, etc., then see what your dominant colors are. You might pick out the first five colors that you LOVE and see what compliments these shades. You might hold each color next to your face under a well-lit mirror (or a trusted friend) and decide whether this shade is working for you. A good color will give your eyes that extra "pop" and even out your skin tones. 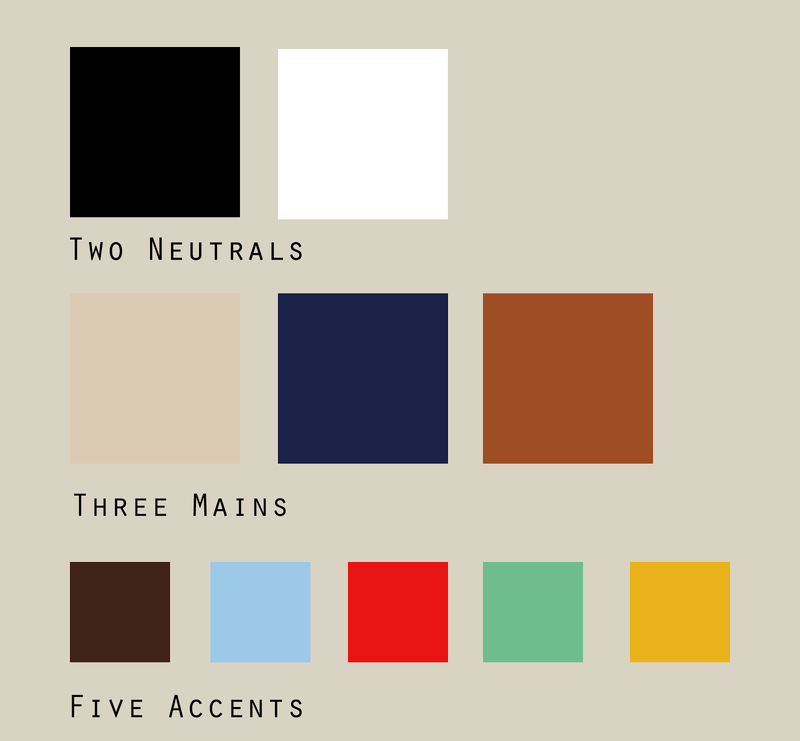 Whatever method you choose, you're shooting for three color categories: neutrals, mains, and accents. A neutral color works as a base. It should be the most versatile shade in your wardrobe. Black and white are obvious neutrals, but you might also go for browns, beiges, creams... or even something less obvious, like burgundy. As long as it works with everything else in your palette, you can consider it a neutral. A main color should be something you love to wear. It's probably a color that already dominates a large portion of your closet. Ideally, it's also a color that looks good on you. My most favorite color in the world is a bright acid green, but I know better than to let it anywhere near my face! An accent color might be a shade you're not certain about, maybe even a little intimidated by. It should offer contrast to the other colors, or harmonize with them in a striking way. A bright pair of pants, a red necklace, or a white belt against darker colors are all examples of accent tones in action. Since I already had a healthy mix of clothing on hand (rubix cube syndrome), I built my palette off colors already present within my closet, and eliminated* the rest. Keep in mind that color palettes aren't restrictive or absolute. If you find something beyond the palette that you find works with the rest of your wardrobe, by all means, welcome it to the family. As a well-known pirate once said, "They're really more like guidelines." NOTE: The color palette approach presupposes that you already have an idea of what works on your body, and you like at least half of what's in your wardrobe. If you're still struggling to find clothes that work for your style or body-type, take a look at this page to set you on the right path. If you've recently undergone a significant lifestyle change, this might be a choice time to cull your closet and eliminate anything taking up extra space. Read more about closet culling here. *By "eliminated," I really mean "boxed into storage." If you don't have the heart to donate your discarded clothes immediately (or if you think they might work for another season), put them out of sight for a few months. At season's end, challenge yourself to remember what you stored before you pull it out again. If you can't remember, you probably won't miss it! Go forth and donate.